Western blot analysis of extracts of HeLa cells, untreated or TPA-treated, using Phospho-MEK1/2 (Ser217/221) (41G9) Rabbit mAb (Biotinylated) and Streptavidin-HRP (#3999). Immunoprecipitation of extracts from HeLa cells, untreated or TPA-treated, using Phospho-MEK1/2 (Ser217/221) (41G9) Rabbit mAb (Biotinylated) and Immobilized Streptavidin (Bead Conjugate) # 3419. Western blot analysis was performed using Phospho-MEK1/2 (Ser217/221) (41G9) Rabbit mAb #9154, Mouse Anti-Rabbit IgG (Light-Chain Specific) (L57A3) mAb #3677 and Anti-mouse IgG, HRP-linked Antibody #7076 for detection. 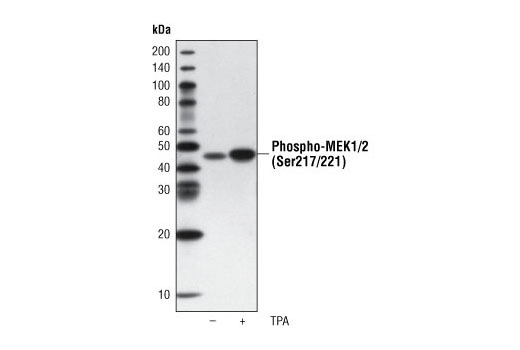 Phospho-MEK1/2 (Ser217/221) (41G9) Rabbit mAb (Biotinylated) detects endogenous levels of MEK1/2 only when phosphorylated at Ser217/221. Monoclonal antibody is produced by immunizing animals with a synthetic phosphopeptide corresponding to residues around Ser217/221 of human MEK1/2. This Cell Signaling Technology (CST) antibody is conjugated to biotin under optimal conditions. 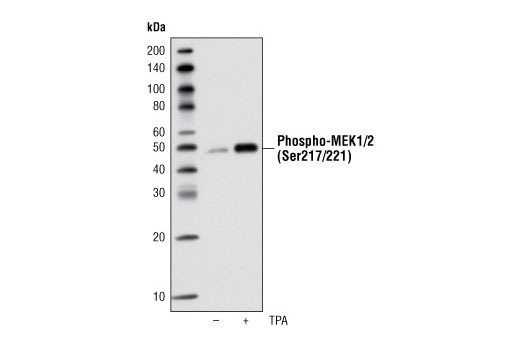 The unconjugated antibody Phospho-MEK1/2 (Ser217/221) (41G9) Rabbit mAb #9154 reacts with human, mouse, rat, monkey and D. melanogaster phospho-MEK1/2 (Ser217/221). CST expects that Phospho-MEK1/2 (Ser217/221) (41G9) Rabbit mAb (Biotinylated) will also recognize phospho-MEK1/2 (Ser217/221) in these species. Crews, C.M. et al. (1992) Science 258, 478-80.